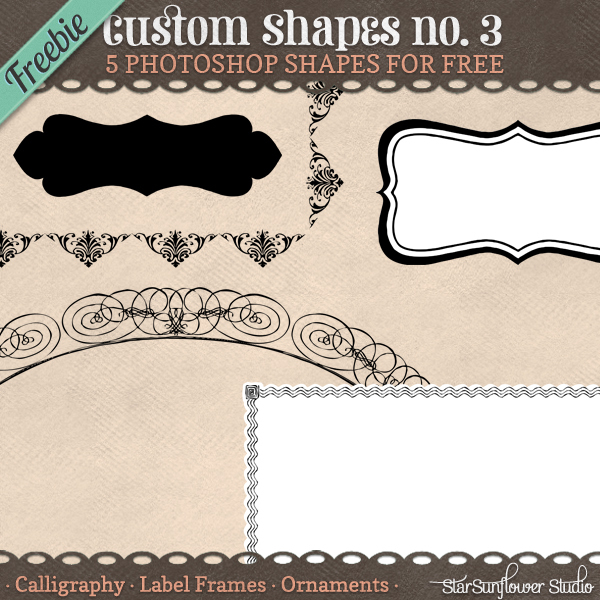 Up for grabs today is a sweet mixed set of 5 free photo shop custom shapes. (PNG are included for those who are running gimp or PSP). I really lucked out with the poll results last week because I happened to have some created shapes stocked up to deliver to you! Ok a little story first. I started a shop in addition to Etsy so people can get instant access to downloads without waiting for me to email them the goods. Unfortunately even for freebies in this cart it requires the user to create an account. In other words, guest checkout isn’t available for digital goods. I’m going to start putting all of my resources up there so I don’t have to worry about my files being scattered all over on the download sites. Those of you who are used to downloading freebies from digital scrapbooking shops are used to this gig. So here it is! Sorry to hear you haven't been sleeping. Hope you get to do something fun this weekend! And thanks for the shapes!! Your hard work is appreciated! I visited your shop and got these there. How cool! Everything went really smoothly! Easy-peasy! LOL Thank YOU!! These are great, I've used many of your shapes in the past. Thank you for sharing.